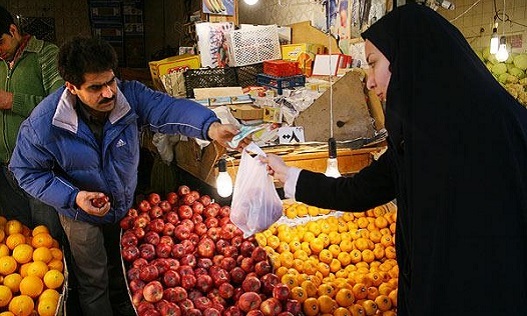 In the final weeks of the Iranian calendar year, as Iranians prepare for new year celebrations, fruit prices have jumped by 18.4 percent and vegetables by 8.7 percent, while price hikes are also being reported for other food items. ISNA reported on Saturday March 12 that in addition to produce, prices have increased for dairy products, meat, sugar and oil. The Ministry of Health’s nutrition department announced last summer that 90 percent of the population is limiting its consumption of fruits and vegetables. The rising price of food, especially around the new year celebrations, often becomes a serious concern for Iranians and pushes the price of fruit and food items into the headlines. Labour organizations says the monthly expenses of a household of four approach 3.2 million toumans, but the Supreme Labour Council has put the minimum daily wage of 13 million labourers at just under 27,000 toumans.